Musical Fidelity M6 Encore 225 review | What Hi-Fi? What is Musical Fidelity’s M6 Encore 225? It’s a modern, premium all-in-one, which includes every bit of electronic flexibility you need to make up a system (bar speakers). There was a time when a product such as this would be seen as a compromise choice – one for those that prioritise neatness over performance. Such a product would also have been a cheaper alternative to a quality separates set-up. But one look at the Encore’s hefty price is enough to suggest there’s something more ambitious going on here. What’s in the box? The substantial full-width chassis contains an upgradeable 1TB of storage, a CD player/ripper, internet radio with Tidal integration and 225W per channel of amplification. There are also digital inputs to complement their analogue siblings. That price tag may be high, but Musical Fidelity certainly hasn't scrimped. It’s the built-in hard-drive that takes us by surprise. This approach has fallen out of fashion in recent years, with most companies preferring to promote use of an external NAS (Network Attached Storage) device instead. There are advantages to a built-in drive, though, particularly speed of response and stability. Use a NAS unit and there is a certain amount of latency caused by the streamer section pulling the music across the network from the NAS. There’s also the downside of networks issues affecting playback or causing glitches. Musical Fidelity avoids both issues with its design approach, though having a drive in the same box as the sensitive audio circuitry creates its own challenges. If 1TB (or around 2500 CDs) doesn’t sound like enough, you can double that for an extra £80. All the processing is done by a dual-core 64-bit Intel CPU, which comes equipped with 2GB of RAM. This processor has been chosen to enable easy upgrading, making the 225 something that can be usefully improved over time. That Tidal integration is a recent addition, for example. Any music you have already stored on an existing NAS or network-attached computer has to be copied over first. This transfer is done through an app on your phone or on a computer using Google Chrome, but you’ll need to be connected to the same network as the Encore. Transferring music in this way is a simple drag-and-drop procedure, though if you have a large amount of files it’ll take a while for everything to be copied over. Put a CD in and the Musical Fidelity will default to ripping the disc onto the in-built drive rather than playing it straight away. This is done primarily to help with speed of playback. Once copied, the player can read the music files quicker and more accurately than if it had to fetch the information from the disc. Play the CD directly and any reading errors have to be corrected on the fly, affecting performance. Ripping it means multiple reads can be taken to ensure the maximum amount of information is recovered. Should you wish, you can just play a CD without ripping it. But in our tests it doesn’t sound as organised or focused. The same process occurs when reading music files from any of the four USB type A inputs. Analogue fans haven’t been ignored. There are three single-ended line-level inputs as well as two optical and a pair of coaxs. 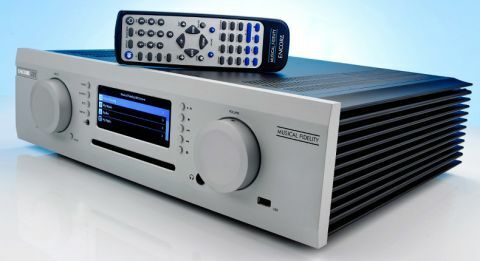 Both types of digital input can accept 24-bit/192kHz music streams. Don’t get too excited about the presence of a USB Type B connection, though. Music Fidelity has reserved this one for dealer/factory use. We’re surprised the company hasn’t included Bluetooth connectivity. This is fast becoming a universal way to connect portable devices to amplification products so it seems a misstep in an otherwise well-equipped unit. There’s a version of the Encore that doesn’t have internal power amplification, saving around £800 in the process. Our sample has 225W per channel modules built-in. These are the same as used in the £2750 M6si integrated amplifier. If for some reason this isn’t enough, you can add extra muscle thanks to a preamp output. In use, Musical Fidelity’s decision to build in the hard-drive pays off with responsiveness that’s alien to alternatives that take music off a separate NAS device. The Encore is speedy, and switches tracks and sources in an instant. We’re less impressed by the dedicated app, though. It looks cluttered and isn’t as intuitive as some we’ve used. It’s also a little glitchy. You could use the (cheap-feeling) supplied remote instead, but it isn’t much good if you want to scan through a large music library. Try the front panel controls and it all feels a bit clunky. Even something as simple as powering down the unit is a multi-step operation. The Encore’s sound is big-boned and bold. It has a fluid, full-bodied balance that still has enough in the way of bite to satisfy with the likes of both Stravinsky and Eminem. We play Stravinsky’s The Rite of Spring and like what we hear. The Musical Fidelity delivers a large-scale presentation, one with plenty of authority and drive. That generous power output helps it to render wide-ranging dynamics with a good degree of control. The stereo imaging is pleasing, with the Encore painting on an expansive and spacious canvas. Instruments are nicely separated and the overall lack of clutter is admirable. There’s a good degree of precision here too, coupled to a convincing layering of the orchestra. The Encore keeps things decently organised – no small feat considering the demanding nature of the recording – and manages to communicate plenty of the piece’s drama. Moving onto Eminem’s No Love reveals a healthy portion of attack, though the Encore doesn’t render the hard-charging momentum of the track with quite the determination we would like. We also hear a bit of an edge to the sound that emphasises the lack of refinement of the recording. Mind you, this edge (coupled to a touch of excess brightness in the upper frequencies) also helps the Encore sound exciting and open, so it’s a trade-off some won’t mind. There’s certainly no shortage of clarity, particularly in the midrange - Eminem’s rapid-fire lyrics are delivered with poise and purpose. The Encore has a consistent character whether you listen to hi-res 24-bit/192kHz files of The Dark Knight Rises OST or Solange Knowles’s Cranes in the Sky streamed from Tidal. Try either the optical or coax digital inputs and you’ll find them capable. There’s not quite the transparency of the line-level inputs – reatively, the sound lacks a little in substance and refinement – but it remains enjoyable. We’re pleased with the headphone output, too. It retains the character we hear through the speaker terminals, coupling scale, authority and openness to good effect. There’s a fair amount of detail here, and plenty of dynamic expression. Such outputs are usually box-ticking exercises for manufacturers so we’re pleased Musical Fidelity’s engineers have taken care to ensure such a good sound. We think there’s a place for the M6 Encore 225. It’s well equipped, with Musical Fidelity’s decision to use the internal hard-drive for playback paying off in impressive responsiveness and stability. While we have certain small issues with the performance (and slightly less small issues with usability), it proves a fine way to get impressive sound without a stack of electronics or nest of wires.